Sandia National Laboratories mechanical engineer Terry Johnson, left, the project leader for the Hydrogen Station Equipment Performance (HyStEP) device, and National Renewable Energy Laboratory researcher Chris Ainscough prepare HyStEP for testing at NREL’s Energy Systems Integration Lab. HyStEP will accelerate hydrogen refueling station commissioning. 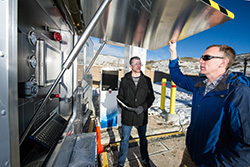 (Photo by Dennis Schroeder/NREL) Click on the thumbnail for a high-resolution image. LIVERMORE, Calif. — Drivers are seeing more hydrogen fuel cell electric vehicles (FCEVs) on the road, but refueling stations for those vehicles are still few and far between. This is about to change, and one reason is a new testing device being validated at California refueling stations that will greatly accelerate station commissioning.